He is interested in Laparoscopic Surgery in general with a focus on the areas of colorectal and hernia surgery. He has special expertise in a broad range of hernia surgeries, from the simple unilateral inguinal hernia to a giant hernia with loss of domain. Umbilical hernia repair with placement of an intra-abdominal patch. Dr. Tollens is recognized as one of the leading international experts of complex hernia surgeries and is an active member of the European and Asian Hernia Surgery Society. Dr. Tollens frequently makes contributions to national and international congresses in minimally invasive surgery and herniology. 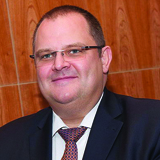 Performing a large number of hernioplasties, he runs annually more than 25 international courses on hernia surgery. He also participates in clinical trials and has published several clinical papers in different international research journals. Dr. Tollens has given more than 400 international communications on different congresses worldwide and published more than 50 international peer reviewed articles. He has contributed by writing a chapter on trans-inguinal & preperitoneal techniques in a surgical book. Dr. Tollens has travelled extensively over the world and in particular in the Middle East covering annually the UAE, Qatar, Bahrein, Oman, Saudi, Kuwait, Egypt, Jordan. Dr. Tollens can converse in Dutch, French, English, African and has moderate knowledge of German language.